The Palm Beach Hotel in Benidorm is truly a wonderful experience, the moment you walk through the door you can start your relaxing holiday. As soon as you enter the hotel you will feel the sense of serenity and relaxing atmosphere. The hotel has a lot of plants inside which makes it look almost tropical, it has to be seen to be believed! The bar area is very elegant and inviting, there are plenty of exotic and exciting drinks for you to try! This hotel is a treat for all the senses! The service in Palm Beach Hotel is second to none, and your stay is bound to be something you will remember for the rest of your life. 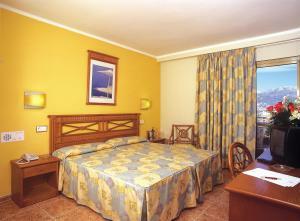 The hotel itself is located very close to the most popular beach, and is 25km away from the nearest motorway junction. The restaurant is very exclusive and serves amazing quality food. Personally I think that the food in the restaurant is amazing, they have a wide selection of different things which is great in case you have any fussy eaters in your family! There’s so much choice it might take you longer to decide what you want to eat than it does to eat it! Relaxing is extremely easy to do at the palm beach hotel, you can soak up the sun by the pool, or you can soak away your troubles in the sauna. If you’re into fitness then there is a very well equipped onsite gym which you will probably want to check out. The hotel offers everybody a free car parking space which is great if you have hired a car, however a hire car isn’t required as there is a free bus every half hour to take you down the hill and into the town. Alternatively it takes quarter of an hour to walk into town. There is also an indoor and outdoor pool, business facilities, ticket service, and car rental service. The front desk is available 24 hours a day, and you can order room service if you’re too lazy to venture out. All of the staff at the Palm Beach Hotel are extremely friendly, and very helpful. Nothing is too much to ask, they just want you to enjoy your stay as much as possible. If you don’t hire a car then the easiest way to get to the hotel is by taxi, these are easy to get just outside of the airport. You can check into your hotel room between 12:00 until 18:00, and you have to check out by 12:00 noon. Tell Us About Your Favourite Hotel! Please tell us about your favourite Hotel in and around Benidorm! We would love to hear from you. It is very easy to do. 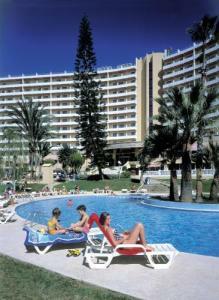 Simply click here and tell us about: Your Favourite Benidorm Hotel?